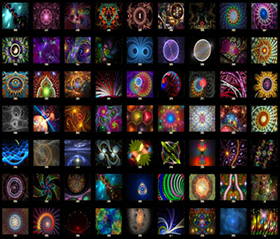 The Electric Sheep offers a free screensaver to participants whose computers work to render elaborate abstract animations. The Lumen Prize winning video documentary about the Electric Sheep. The distributed renderer at work. The lineage of an Electric Sheep, showing its ancestors and descendents. Archive of all the generations of Sheep. News: the Android Live Wallpaper version of Electric Sheep just won a ZKM App Art award. This is a distributed system, with all participating computers working together to form a supercomputer that renders animations, called "sheep", that everyone sees. The human participants guide the survival of the fittest by voting for their favorite animations in the flock. You can join this project by downloading the Electric Sheep Screensaver. 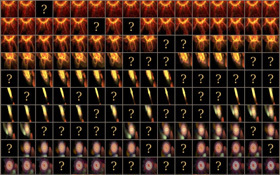 Each participating computer follows mathematical instructions, Draves' Flame algorithm, to render its own piece of the larger work, as seen in the table at left. The images are sent back to a central server which compresses them into animations which are sent back out to the viewers. 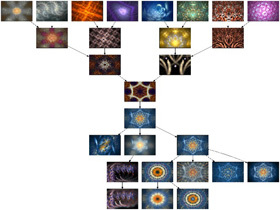 The electricsheep.org website shows the family tree for each sheep, including its parents and offspring, and viewers can track family resemblance. The artist's Clade series shows a selection of family members in high resolution. Like Draves' other software art, the Electric Sheep code is open source, which has allowed it to benefit from code contributions from many enthusiastic programmers. Now Draves serves as head Shepherd on a project with many participants.